How do I know reminders have been delivered? Expiration and renewal email reminders can be configured in Restrict > Settings > Emails. Expiration reminders are sent to users who do not have auto renew enabled. The emails remind users that their subscription is expiring soon and encourage them to renew. Renewal reminders are sent to users who have auto renew enabled. The emails remind users that they will be automatically billed soon. You can add multiple reminders of each type. Notice Type - Type of notice to create, either "Renewal" or "Expiration". Email Subject - Subject line for the email. Template tags may be used in the subject. Email Period - Specifies when the email should be sent, relative to the user's renewal or expiration date. Enable Notice - Whether or not the notice should be enabled. If unchecked, the email will not be sent to any users. This allows you to save notices as draft or test different messages without deleting them. Email Message - Main body of the email. Template tags may be used here. 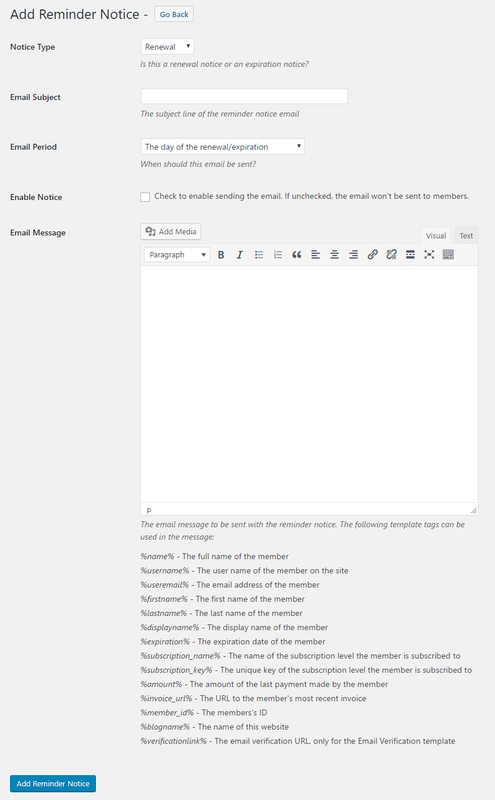 Each reminder has a "Send Test Email" link in the table. %name% - Replaced with "NAME GOES HERE"
%subscription_name% - Replaced with "SUBSCRIPTION NAME"
Test emails are best used to check formatting and to ensure emails are being delivered. "April 20, 2017 11:07:02 - Expiration notice was emailed to the member - Two days before renewal/expiration"
This allows you to verify that the email was successfully sent.